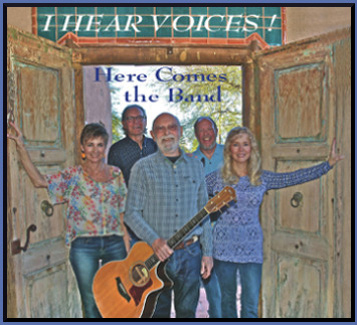 Our Latest CD: Here Comes the Band is the 3rd CD from Tucson vocal group I Hear Voices! This CD demonstrates what happens when a band has a single idea about group identity, and works hard at it for over five years. You can tell it's the same 4 people who sang on the first CD, but clearly something has changed. You could say simply that the sound has gotten stronger, and that'd be hard to challenge. It's as if this group has spent its time singing together, getting to know themselves as a group, and then feeling solid about it. Bobby Kimmel, Kathy Harris, Bobby Ronstadt and Suzy Ronstadt are the 4 singers. Jack Culver on mandolin is now a regular member of the band, with Kimmel on rhythm guitar and the other members regularly playing percussion of some sort.